Card Text Your opponent cannot play more than 2 cards each turn. If I have Ember Imp in play and my opponent plays Wild Wormhole (“Play the top card of your deck”) as their second card for the turn, does Wild Wormhole allow them to play a third card from the top of their deck? No. Ember Imp prevents more than 2 cards being played from any location (e.g. hand or deck). Therefore, no additional card would get played and Wild Wormhole’s ability would not resolve. Likewise, if WIld Wormhole was the first card played during your opponent’s turn, the card played from the top of your opponent’s deck (via WIld Wormhole) would count as their second card for the turn. If Ember Imp is destroyed after my opponent already played 2 cards on their turn, can they play more cards? Yes. 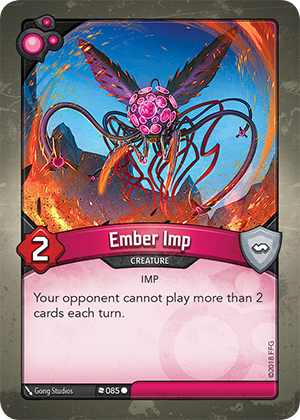 Constant abilities (such as Ember Imp’s) are active so long as the card remains in play. When Ember Imp leaves play, its effect expires.